You will love the attention to detail paid in the design of this beautiful casual jacket. It is cut in a loose, free flowing style that is ultimately comfortable. The jacket is presented in three color choices. Select your favorite from burgundy, black or a dark olive green. 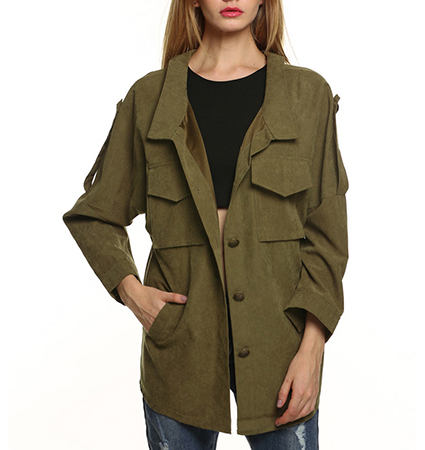 The jacket buttons up the front with matching buttons and has three quarter length sleeves with attached Epilates. It has narrow lapels and slanted, slit pockets at the bottom. It also has two breast pockets with flaps. There is a slit at the center of the bottom in back to allow for a wider range of movement. This jacket is available for purchase in sizes Small, Medium, Large and Extra Large.